Anyway, I’m in the midst of writing a stitch dictionary, among other things, and I was getting fed up with not being able to share any of the things I was doing. So I decided to make something that’s not going in the stitch dictionary and share it with you. I used my secret code techniques to lay the word Spring out on several different grids, and ended up liking this one a lot. 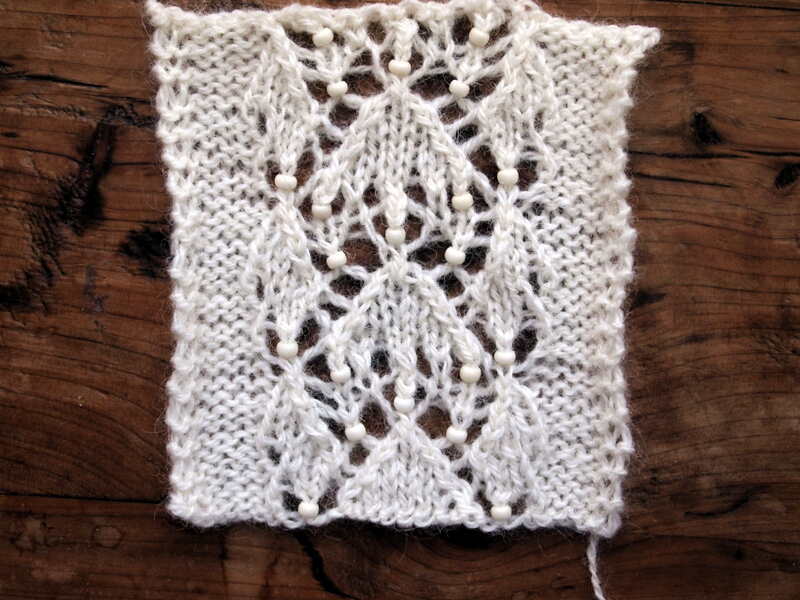 I made one lace design from it and also a stranded knitting chart. The stranded chart is mirrored vertically as well as horizontally. 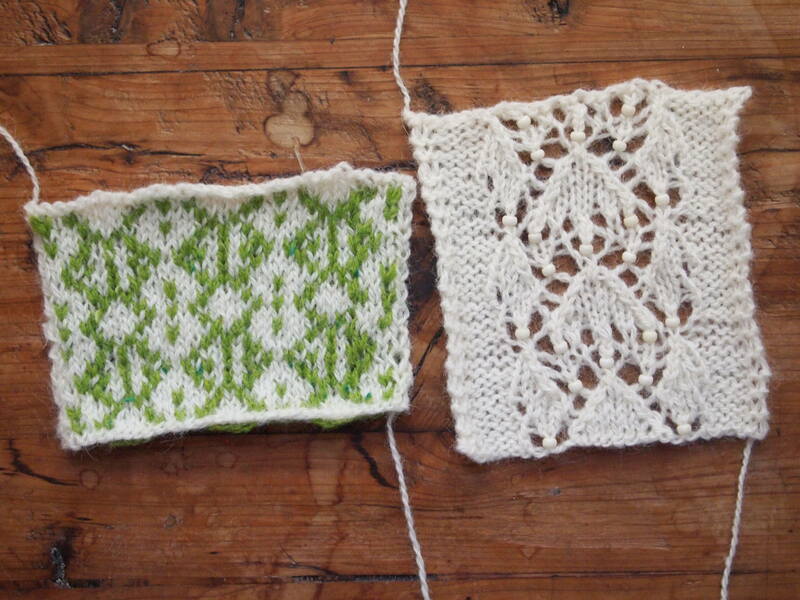 The lace one has an extra column down the middle and on each side; this avoids a double yarn over. I dote on double yarn overs, but I know that not everyone is comfortable with them. multiple of 10 + 1 stitches and 10 + 1 rounds. Round 1: Work knit as follows; *1 CC, 1 MC, 1 CC, 5 MC, 1 CC, 1 MC; work from *, 1 CC. Round 2: Work knit as follows; *(3 MC, 1 CC) x 2, 2 MC; work from *, 1 MC. Round 3: Work knit as follows; *1 CC, 3 MC, 1 CC, 1 MC, 1 CC, 3 MC; work from *, 1 CC. Round 4: Work knit as follows; *3 MC, (1 CC, 1 MC ) x 2, 1 CC, 2 MC; work from *, 1 MC. Round 5: Work knit as follows; *(2 MC, 1 CC) x 3, 1 MC; work from *, 1 MC. Round 6: Work knit as follows; *(1 MC, 1 CC) x 5; work from *, 1 MC. Round 7: Work knit as follows; repeat round 5. Round 8: Work knit as follows; repeat round 4. Round 9: Work knit as follows; repeat round 3. Round 10: Work knit as follows; repeat round 2. Repeat rounds 1-10 as desired, ending with round 1. 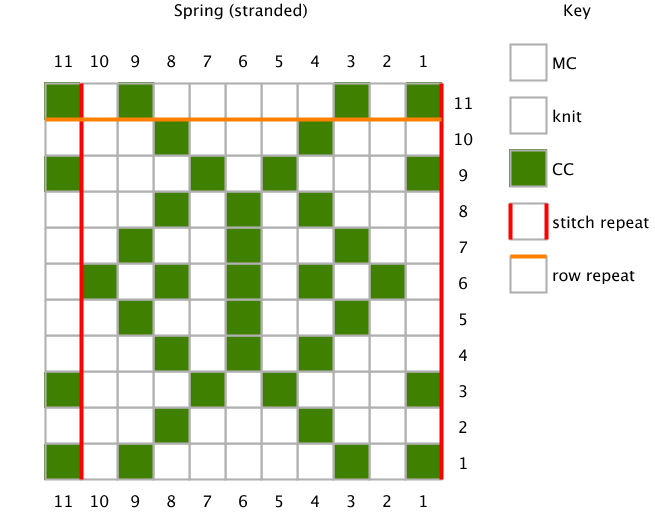 Spring is a multiple of 14+1 stitches and 12 rows. 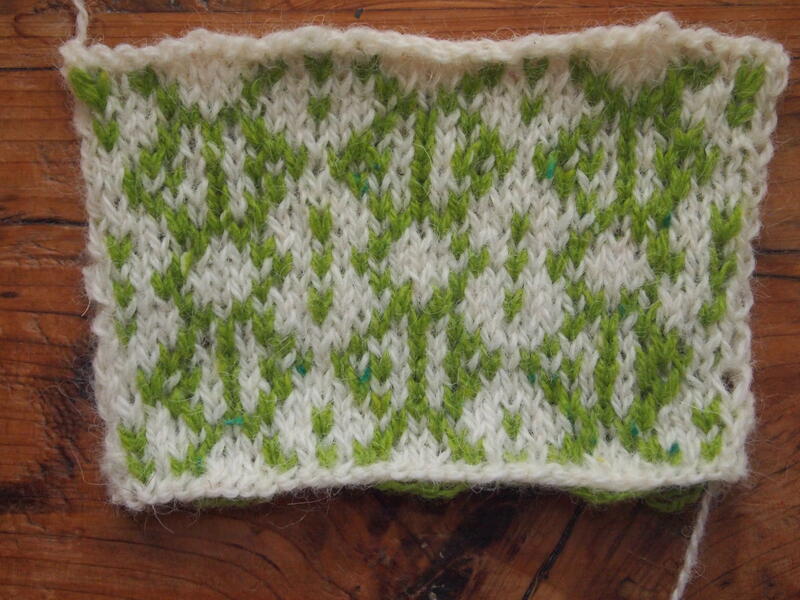 kb: place bead on stitch, then knit. Round 1: *p1, yo, kb, yo, cdd, k5, cdd, yo, kb, yo; work from *, p1. Round 2 and all even-numbered rounds: *p1, k13; work from *, p1. Round 3: *p1, k3, yo, ssk, k3, k2tog, yo, k3; work from *, p1. 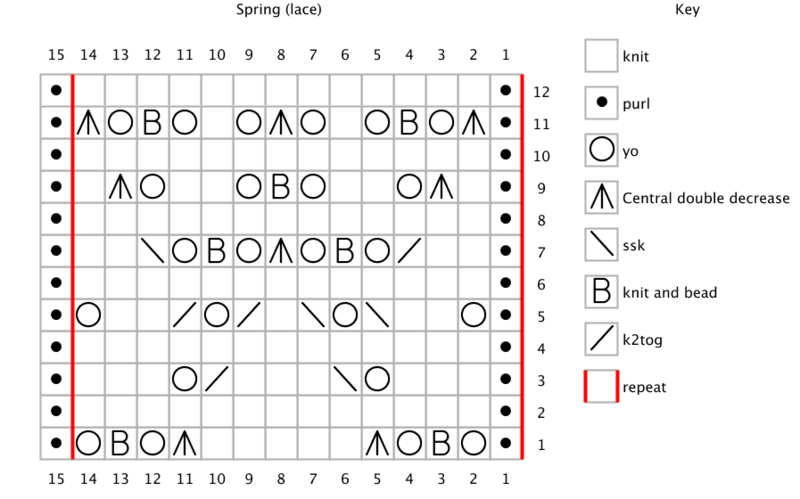 Round 5: *p1, yo, k2, ssk, yo, ssk, k1, k2tog, yo, k2tog, k2, yo; work from *, p1. Round 7: *p1, k2, k2tog, yo, kb, yo, cdd, yo, kb, yo, ssk, k2; work from *, p1. Round 9: *p1, k1, cdd, yo, k2, yo, kb, yo, k2, yo, cdd, k; work from *, p1. Round 11: *p1, cdd, yo, kb, yo, k1, yo, cdd, yo, k1, yo, kb, yo, cdd; work from *, p1. Note: the instructions are written for in the round; make sure to swap the knits and purls on even-numbered rows if working flat. …and if Spring is here, can Summer be far behind? Beads are entirely optional. I put them in because there’s not always a good place for them in my stitch patterns, and I wanted to show the possibility for those who like them.